(well-deserved and honourable that it is) – simply because it was the first steam locomotive to be accurately timed in reaching 100mph. Seagulls take flight as ‘A3’ No. 60103 Flying Scotsman passes Rhyl on June 15 on its way to Holyhead… with bystanders behind the yellow line. GEOFF GRIFFITHS. This was on November 30, 1935, but was short lived, for on March 5 that year, it lost the record to classmate ‘A3’ No. 2750 Papyrus, which reached 108 mph. No. 4468 Mallard broke the all-time record, reaching 126mph, which surely will never be broken. The world’s most famous locomotive, a label bestowed on Flying Scotsman, was the LNER publicity (propaganda?) slogan when the bitter rivalry with the LMS was being played out pre-war. This should nowadays be past its sell-by date, but is still trotted out in some sections of the media. This accolade should, by right, be the preserve of Mallard, and the £4.2million expended on restoring Flying Scotsman should have been spent on the ‘A4’. After the disfiguring of a once extremely handsome ‘A3’ locomotive with ugly ‘elephant ears’ smoke deflectors and ungainly double chimney, I would not even cross the road to take its photograph. I’D LIKE to express my appreciation of Andrew Bell’s picture of the ‘Black Five’ steaming through Strathallan in the last issue. It shows that you don’t have to scramble all over the track in a hazardous manner to get great photographs. IN LINE with your comment in the June issue regarding the farcical situation with Flying Scotsman main line trips, I was very disappointed that the loco was ‘banned’ from coming over to Norwich recently, due to the higher possibility of public trespass on the line here in East Anglia. 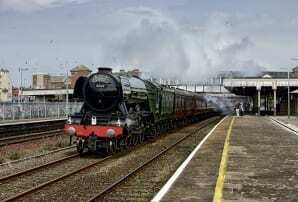 It’s OK for it to travel along the East Coast Main Line, where other trains travel much faster? Perhaps the loco should be just kept in a place where people could see it in complete safety. They will be putting fences along roads and rivers soon! I TOTALLY agree with Chris Milner’s Train of Thought comments about no timing details for the Flying Scotsman runs. I have, for the last few years, donated a small amount every month towards the Keep Scotsman Steaming fund, and now wishing to see it in action, I am being thwarted by the ‘wrong side of the fence’ brigade. On June 11 the loco was due to go on the Blyth & Tyne about a half mile away from my home, and I would rather know when it is passing instead of guessing and hanging around for a few hours. Have these mindless idiots spoilt it for all of the genuine and sensible enthusiasts out there? Mr Smith makes a valid point about ‘hanging around’. There is a tendency in such situations, as the general public get bored, to wander further along the lineside, and this encourages others to do the same, creating a bigger problem. If times were published, people would turn up, take their picture and go home. – Ed.